SMB Harwal Electric introduces the third generation of the proven and versatile iNTELECT modular switchboard system featuring the strength of custom-built configurations with the flexibility of modular construction. Engineered in Australia for Australian conditions, the iNTELECT G3 system joins SMB’s range of advanced low voltage electrical switchboards designed for demanding energy distribution applications in industrial, commercial, health, infrastructure, water and waste water, resources, energy, retail and financial sectors. SMB Harwal Electric General Manager Mr Terry Schweickle explains that the latest design progression of the iNTELECT system is the most robust and versatile in the series, benefitting from 25 years of continuous R&D. He adds that the G3 system integrates SMB Harwal and SMB Macquarie’s extensive manufacturing and product testing experience, with valuable customer input accumulated over many years of Australian market leadership. iNTELECT is a complete system engineered by specialist switchboard manufacturers that can be custom engineered to suit the customer’s individual requirements. 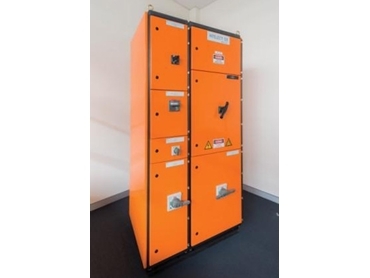 The iNTELECT busbar system is arranged in a patented matrix pattern in which the main busbars occupy a range of predetermined vertical and horizontal positions arranged for maximum mechanical strength and cooling, with phases fully insulated and segregated from each other to create a compact, safe switchboard. Engineered for superior strength, the modular system features a frame strong enough to be lifted from the top, adding to ease of installation and maintenance. Access is further enhanced by a unique stainless steel 180-degree door hinge with continuous polyurethane door seals machine-applied for maximum protection and long life. The busbar system takes minimal depth within the switchboard while offering maximum flexibility in switchboard design without departing from type test certification. Busbar connections can be readily accessed for maintenance and system expansion. SMB Harwal and SMB Macquarie are part of the international SMB Electric Group, a market leader in the manufacture of low voltage switchboards and motor control centres in Singapore.